Guys, guys, guys, the weather is finally cooling down! I know as soon as I say that it’ll shoot back up into the 90s, but there you have it. It’s slowly easing its way out of the 80s right now and just dabbling in the high 70s later this week. This means many things; sweaters will soon emerge, boots will be back in fashion, running might be a thing (who knows), but high up on the list, up there with the scarfs and hats coming out, is tea season! I realize, of course, that tea is for every season. There isn’t ever a bad time to drink tea, but it is so very fitting for fall. Fall brings cool crisp days to sit and watch the leaves with a nice warm cup of tea. It brings rainy days, perfect for curling up with a cup of tea and a good book. It may or may not bring colds that only tea can cure. Whatever the occasion, fall is the ultimate tea season in my mine. Tea is one of those things that I had to grow into. I remember drinking tea as a kid, every so often, but it wasn’t usually my first choice. I always liked the idea of tea parties, though, because they’re delightful things. I liked fancy tea wear, even if I didn’t really drink it that often. We always had tea bags, of course, because loose leaf tea is for people who are really dedicated to their tea drinking in a way most people aren’t. We did, however, start getting loose leaf when I was in high school and a friend opened a tea and coffee store.We still used the bags that you fill yourself, though, instead of tea infusers. If you’re lost, tea infusers tend to be metal mesh objects that you put the tea leafs in to steep them without them getting all through your tea. They are most commonly in ball or cup form that hook onto the side of your cup or dangle in it like a tea bag. They also make fun ones from plastic that are shaped like animals. I have a cat and he’s very cute. I didn’t really get into tea until college. It’s a very writerly drink. All of my friends were really into it and then, of course, I met a boy. I would like to think not everything comes back to meeting this boy, but let’s be honest, it really does. My husband, Logan, is really, super, extra into tea as a hobby. He has the whole brewing process down to a science. He’s got a standing timer on his watch for each different kind of tea, because they all steep for a different amount of time, and he knows the difference between loose-leaf and tea bags and can tell you exactly why loose-leaf is better. It has something to do with the purity of the tea and all the crap they grind up and stuff in with the tea in tea bags. He got so excited about the super fancy electric kettle at work that has different temperature settings for the different teas, because that’s a thing too. 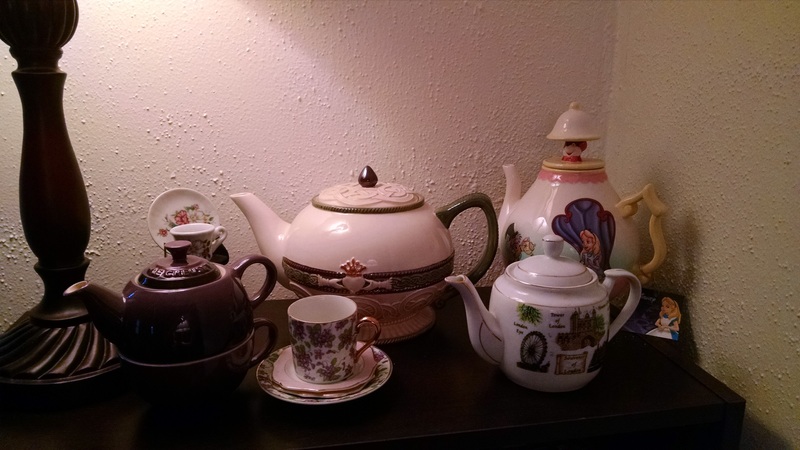 So, naturally, when I started dating the guy who was really into tea, I started picking up a few things. For a long time my favorite tea was orange spice, because it tastes like orange and I love orange. That was about it. I have since gained an appreciation for many different kinds of tea, including Earl Grey and Sencha Kyoto, which is kind of cherry-ish. My favorite, though, is a green chai tea with orange peel that I found in a little shop down in the strip district in Pittsburgh, by way of my mom-in-law’s tea basket. It really is the most delightful thing, not as heavy as some chais or overbearing with the taste. Some chais are too strong for me, but this one is really lovely. It was my Twirly, actually, who got me into chai tea in the first place. She was super into it in college and we would make a trade when we lived together. I would make her a brownie in a mug, if she would make me chai. It worked out well on both sides, I think. 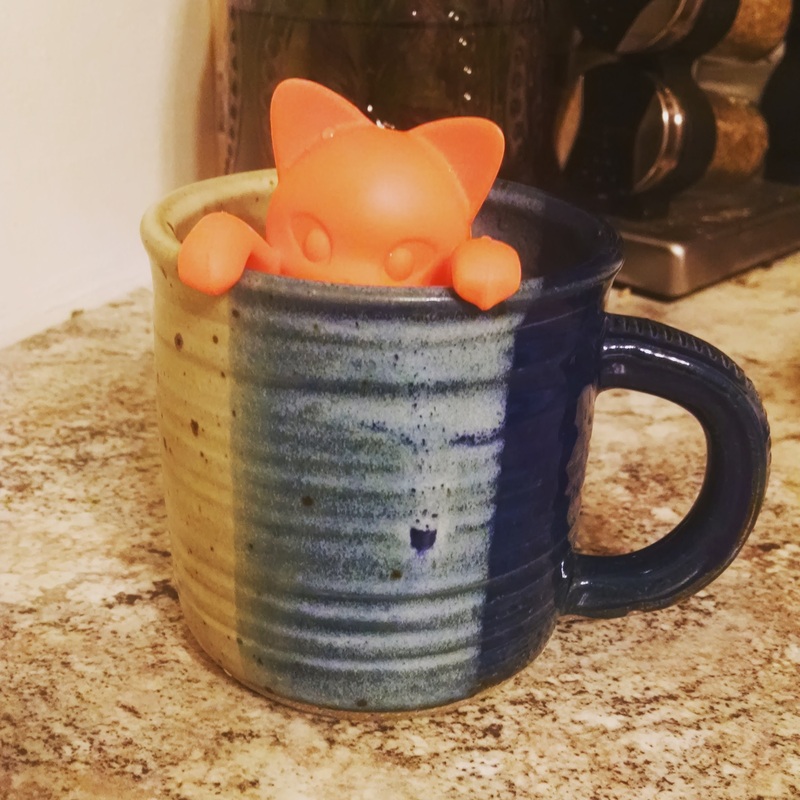 When we used our Keurig I had found these really awesome chai latte cups that I was very fond of. There is part of me that wants to bring the whole, bulky thing out again just so I can make them, but I’m not sure it’s worth it. Maybe someday it will be. I always have the option, and like two precious cups left. For a wedding present, my Twirly got me this beautiful Irish tea pot. When my dearest Dakota came to visit while doing her final course work for her masters degree I finally got to actually use it. I made chicken salad sandwiches and scones with my mom-in-law the day before, and we sat and ate lunch and drank tea like civilized people and it was super lovely. I’ve decided I need to have more tea parties. They encourage me to clean, for one thing, and they are a delightful way to catch up with friends. I just need to bring down my tea cups from my parents place so that I can serve tea to more than one person in a fancy cup. I know it’s probably been a little strange reading a post about tea from a blog generally promoting coffee, but I firmly believe that all hot drinks are created equal and should be enjoyed equally. Coffee is delightful, but sometimes, you just need a good cup of tea. I hope you enjoy all of your preferred hot beverages this coming fall season, and I hope you have a lovely day, dear friends.